If you forgot your password, or you’d just like to change it from time to time, we’ve got an easy way for you to do that. 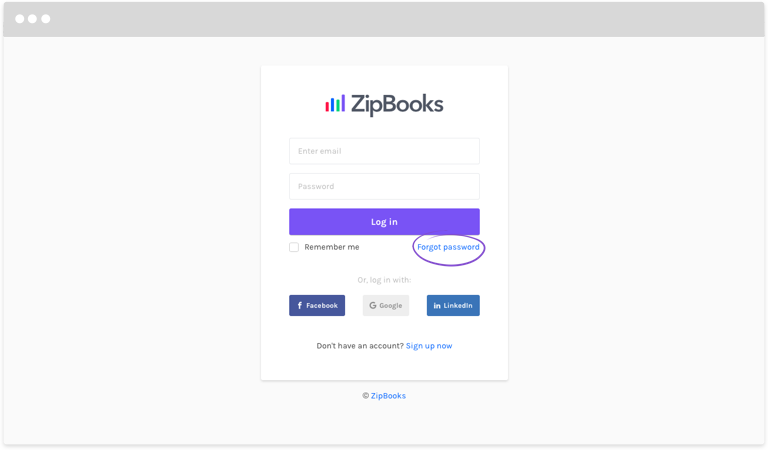 Start on the ZipBooks Login page. Click the Forgot Password link right under the purple Log in button. You’ll get an email from ZipBooks. Open it and click on the Reset Your Password button. Choose a new password, enter it again on the next line to confirm, and then click Reset Password. If you’re still having trouble logging in, please contact help@zipbooks.com or send us a message using the blue chat bubble in the bottom right corner of your screen. From your ZipBooks dashboard, select your profile image from the top right. Click on the gear icon next to your name. We’ll automatically email you a link to process the password reset. When you receive the email, click on the button to “Reset your Password.” If you do not wish to change your password at this point, just ignore the email and your password will stay the same. Note: Make sure that you choose a good password, since this is your business and financial information, and you don’t want anyone messing with it. Use a combination of uppercase and lowercase letters, numbers and special symbols to ensure that your password isn’t too easy to figure out.